Transcending politics and ecology, an Israeli cosmetics firm goes global. 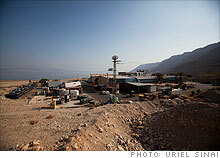 The Ahava Dead Sea Laboratories factory, on the shore of the world's lowest-lying lake. Ze'evi Ma'or, VP of R&D, displays raw mud outside Ahava's Dead Sea factory. While Gaza burns, one small company brings Israeli and Palestinian software engineers together. MITZPE SHALEM, West Bank (Fortune Small Business) -- It's a scorching hot day at the Dead Sea -- 102°F, to be exact. The afternoon sun beats down on the rocky hills and quicksand pits that surround the still, gray-blue body of water, which is flanked by Israel and the West Bank on the west and Jordan on the east. As its name implies, there's little life in the Dead Sea. The water's extraordinarily high salt content prevents fish and aquatic plants from living in it. There isn't much action outside the water either, except for a few emaciated camels trudging along the side of the road. At first glance, it's hard to see much economic potential in this parched, dusty landscape. But up the hill and across the narrow highway that hugs the Dead Sea, an Israeli company named Ahava (Hebrew for love) has built a small cosmetics empire out of the region's elemental resources: salt and mud. About 20 years ago Ahava was little more than a stand hawking bottles of body scrub to tourists. Today the company sells its moisturizing lotions, exfoliators and mineral masks in more than 30 countries, generating sales of nearly $150 million a year. In the U.S., its largest and most profitable market, Ahava has signed distribution deals with the likes of Lord & Taylor, Nordstrom (JWN, Fortune 500) and beauty-supply chain Ulta and has poured millions of dollars into an advertising campaign aimed at wooing American consumers. 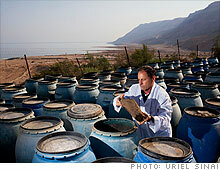 Ahava has come a long way from its modest origins at the Dead Sea, the lowest point on Earth. But major challenges remain. Will global consumers flock to an Israeli lifestyle brand despite the polarizing impact of the Israeli-Palestinian conflict? And what happens to Ahava's business model if the Dead Sea runs dry? It all began in 1988, when Ziva Gilad, a local spa technician, noticed female tourists bottling mud to take home. That sparked the idea for Ahava, and Gilad, along with partners from four nearby kibbutzim (communal settlements), got to work. They started small, selling plastic bottles of mud and salt crystals to tourists at the Dead Sea and, later, in stores throughout Israel. The venture was successful, raking in nearly $1 million in revenue its first year. But early on, Gilad and her partners knew that Ahava needed to become an international company if it wanted to grow. "The future of any cosmetics company can't be in Israel," says Yacov Ellis, Ahava's CEO, who came aboard in 2003 to help build the company into an international brand. "There are only 7 million people in this country." By the mid-1990s, Ahava was exporting its products to Europe and the U.S. It wasn't until the early 2000s, however, that Ahava started to pour the necessary resources into marketing, advertising and branding abroad. These efforts caught the attention of an American investment firm, Shamrock Holdings, which is owned by the Disney family. Last year Shamrock acquired a nearly 20% stake in Ahava. "Thousands of tourists come to the Dead Sea for the spas and the treatments," says Igal Litovsky, senior vice president at Shamrock. "Ahava was uniquely positioned to capitalize on the area's natural resources and translate them into an export product." Litovsky, who now sits on Ahava's board, says his role is to help Ahava strengthen its position in the U.S. market. He has high hopes for the company, which he expects to double or triple in size within four years. Ahava's founders and investors aren't the first to see profit potential in the Dead Sea. At more than 1,300 feet below sea level, the übersalty body of water has been touted for its therapeutic powers for centuries. It's believed that Egyptian ruler Cleopatra and the Queen of Sheba both bathed in the Dead Sea to keep their skin looking young and beautiful. More recently, the sea has been the subject of numerous research studies on therapies for skin disorders, heart and lung problems, and other conditions. What makes the 41-mile-long Dead Sea so special? Scientists believe the answer has a lot to do with the water's extremely high concentration of such minerals as magnesium, sodium, phosphates and bromides -- which Ahava says work together to create a compound that can hydrate skin and slow its aging process. According to Ahava, it's the only cosmetics company licensed by the Israeli government to mine raw materials at the Dead Sea -- which means its competitors have to buy their mud and salt from the company. During the past two years Ahava has spent about $20 million on advertising and marketing, Ellis says. In 2008 it bought a 50% stake in its exclusive U.S. distributor, now called Ahava North America, giving the company more control over where its products are sold in the U.S. and Canada. "We're not L'Oréal; we're a small company, so we need to be really smart about where we invest our money," Ellis explains. Ahava's highly selective brand building has paid off. Unlike some of its competitors, which sell in mall stands, Ahava sells its products in a handful of high-end chains like Nordstrom in the U.S. and Sephora in France. The company already has flagship stores in Berlin, London, Singapore and Israel and is planning to open similar shops in Los Angeles, Miami and New York City within the next five years. It's also working on a new line of mineral makeup, which is due out in early 2010. "They've positioned themselves as a 'prestige' brand," says Karen Stroz, a senior buyer for Ulta. "The unique selling point for the brand is the use of Dead Sea minerals, to which our customers have responded very well." Ahava credits some of its recent success to the trend toward more natural ingredients in cosmetics. It purifies its own water at its Dead Sea factory and says it employs minimally invasive techniques to harvest the mud and minerals used in its products. In addition, the company refrains from testing ingredients on animals, and it packages its lotions in recyclable tubes, bottles and jars. "There's no such thing as 100% natural -- except maybe putting an avocado directly on your face -- but we strive to be as natural as possible," says Ze'evi Ma'or, vice president of research and development at Ahava. Yet although consumers are increasingly looking for products with natural or organic ingredients, they have other choices besides Ahava. "Ahava's origins and its use of ingredients from the Dead Sea can definitely be an opportunity for it," says Karen Grant, global beauty industry analyst at the NPD Group, a market research firm. "But many other brands now tout natural ingredients and ancient remedies." What's more, it's tough for a new, small player to break into the skin-care market. "Women tend to be more experimental with their makeup but less so in the case of skin-care products, where large players like Clinique are still very dominant and very much trusted," Grant observes. Ahava faces political challenges that don't arise for most Western lifestyle brands. In 2002, the London department store Harrods removed Ahava's products from its shelves after a pro-Palestinian group pressured it to boycott Israeli-made goods, including wines and pretzels. After angry reactions from the Israeli embassy and the local Jewish community, Harrods reinstated the items, accompanying them with signs identifying the exact region in which they were produced so that customers could "make a more considered purchase based on their own beliefs and philosophy." Although Ahava won't say whether its merchandise has ever been officially boycotted in the U.S., other Israeli products have recently sparked protests. In June, a pro-Palestinian group called Don't Buy Into Apartheid called for a boycott of Trader Joe's grocery stores because the company sells Israeli frozen cilantro and other products. And in August the New York Post claimed that Oxfam International, a leading humanitarian organization, had dumped celebrity spokesperson Kristin Davis because of her affiliation with Ahava. According to the article, Oxfam made the decision because Ahava's factory is on disputed West Bank territory (the company's administrative offices are located in the Israeli city of Holon, near Tel Aviv). Oxfam denies these allegations. "Recent news stories reported that Oxfam and actress Kristin Davis have ended our relationship," Oxfam said in a written statement. "In fact, Kristin Davis remains an Oxfam ambassador and supporter." Ahava argues that the reports were much ado about nothing. "I wouldn't say [this sort of rumor] has a financial impact on us, but it is annoying," says CEO Ellis. The latest twist in the debacle is that Ahava recently confirmed that its relationship with Davis has ended, although Ellis maintains that ties were severed simply because the actress's two-year contract with the company had expired. Ecology may be the single greatest threat that Ahava faces. Put simply, the Dead Sea is dying. Most of its water comes from the nearby Jordan River, much of which has been diverted by both Jordan and Israel for irrigation and drinking water. What's more, large quantities of water evaporate in the region's hot climate. As a result, the level of the Dead Sea has dropped more than 80 feet in the past 30 years. Some scientists worry that if this trend continues, the Dead Sea could dry out and disappear in the not-too-distant future. Ahava says it's involved with efforts to preserve the Dead Sea -- including a plan to bring in water from the nearby Red Sea in cooperation with Jordan -- and is bullish on the region's future. It may soon have reason to be even more optimistic. Last summer an organization called the New7Wonders Foundation announced that the Dead Sea was among 14 finalists in an international Internet poll to choose the seven wonders of the natural world. That puts the salty lake in the running against some very famous spots, including the Amazon River, the Grand Canyon and the Great Barrier Reef. Although the top seven won't be chosen for another two years, the publicity could help international efforts to save the Dead Sea. In the meantime, Ahava's small factory is churning out as much of its scrubs and lotions as customers will buy. Ma'or and his staff are hard at work on new lines of antiaging products. Despite the blazing heat, construction workers are busy adding another floor to the factory to accommodate the company's growth. Across the road, the still, brackish waters of the Dead Sea seem an unlikely source for a booming, international cosmetics business. But Ahava has high hopes for the lowest point on Earth.